Wrapping your vehicles is a costly investment, so it’s important to get it right. 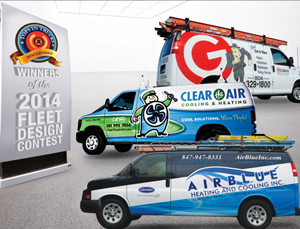 This year’s winners — Air Max A/C & Heating; Colonial Plumbing, Heating and Air; and Sierra Pacific Home & Comfort — have taken boldness in fleet graphics to a new level and are well on the road to success. Staying on track with efficient routing plays a crucial role to offer same day service. Jon Wayne Service Company, a 2016 Tops in Trucks winner, moves forward with another stellar design. This year’s winners — Hurlburt Heating & Plumbing, Krinkie's Heating, Air Conditioning and Plumbing and Tin Man Heating & Cooling — perfectly illustrate what it means to a lasting impression. Fuel management and monitoring is essential for ensuring the efficiency of fleet performance and is vital for the continued growth of your business. As a mobile workforce, it’s crucial to have the best procedures in place to ensure workers’ safety as they commute in company vehicles. When fleet vehicle abuse goes unchecked, it can cost your business a significant amount of money and stress. 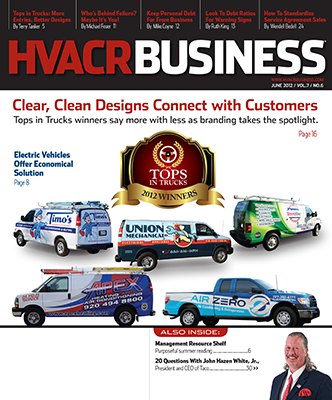 Our 10th Annual Tops in Trucks fleet design contest proves that, when it comes to marketing, branding and professional image, HVACR contractors have stepped up their game in a big way. This year’s Tops in Trucks Fleet Design Contest winners transformed their boring, drab trucks into eye-catching, memorable designs that make lasting impressions with customers. Having GPS is different from having a GPS fleet management system — it’s the difference between the ability to simply get turn-by-turn directions and an intelligent business solution. The 2014 Tops-in-Trucks Fleet Design contest winners were simply brilliant — showcasing clean design, legible text, eye-catching graphics, clean layouts and strong colors. Owning and managing your own fleet keeps you in the drivers seat. From among the hundreds of entries to our popular Tops-in-Trucks Fleet Design Contest, here are this year’s winners, featuring all of the best aspects of good, effective fleet vehicle graphic design. Are electric vehicles right for your company? Many contractors are unsure, as was Tom Robichaud, owner and president of Precision Plumbing Heating Electric in Boulder, CO. The CEO of one of Precision’s long-time clients, Boulder Electric Vehicle, convinced Robichaud to take a test drive because he thought the truck would be a perfect fit for the short routes service technicians drive daily. After that test drive and some additional research, Robichaud became an electric vehicle advocate. 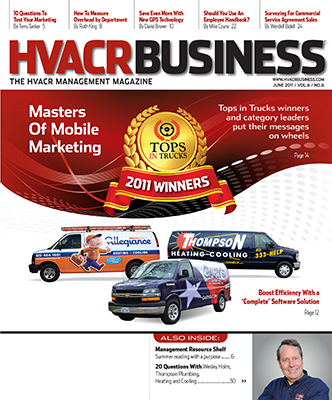 Unpredictable fuel prices and increasing insurance costs for fleet vehicles continue to be challenges for HVACR contractors. Investing in technology can help. 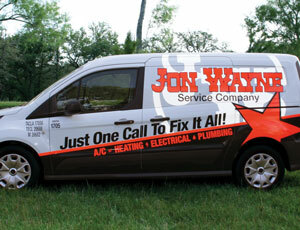 One of the most powerful mobile marketing tools HVACR contractors have is their fleet. 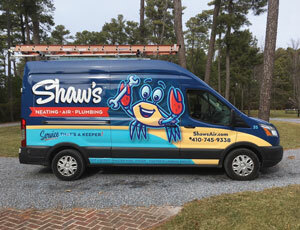 This year’s winners have fantastic-looking fleets that also support each contractor's branding and value proposition. Originally published: 04.01.11 by Phillip J. Schneider Jr. Consider cash preservation, long-term savings, and marketing implications to decide. Your fleet is an indispensable part of your business. Literally, it is your means to reach customers. It also represents a significant liability risk. These are ways to manage the risk. Investing time, training, and resources in a fleetstocking- and-organization program can save money and improve customer service. Think of your vehicles as billboards on wheels. They say a lot about your company. Shouldn't you be leading the process that decides what they will say and how they will say it? One way hvacr contractors communicate their trustworthiness, technical ability, and quality customer service is through their trucks. Company owners who still do not see their fleets as one of the top communication tools and ways to gain customer confidence need to listen to the winners of this year’s Tops In Trucks contest. 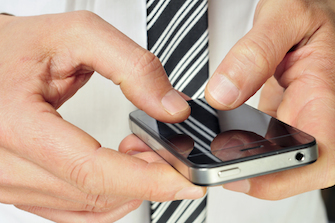 You have roughly 5 seconds to grab a consumer's attention. That's a tall order where fleet designs are concerned. Consumers need to understand at a glance what you sell. Confuse them with too much or not enough information, and you lose potential customers. To guide you, we've recognized contractors who are on the leading edge of marketing efforts to increase sales, competitiveness, and brand recognition. Hundreds of companies sell GPS solutions, each offering a bewildering array of capabilities at a variety of price points. Here are 8 capabilities to evaluate before you buy. The latest trends, technology advances, and simple best practices can cut costs by 30%.